Today’s Spotlight is Headliner: NoviNews, a narrative driven adventure game by Unbound Creations. It’s a follow-up to the original Headliner that was released in 2017, though NoviNews features a completely unconnected story and expanded mechanics. 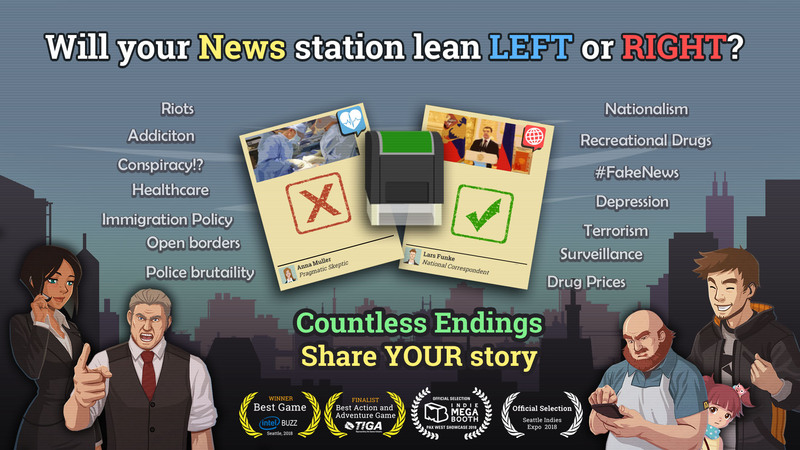 Headliner: NoviNews lets you become the chief editor of your own fake news station in the fictional country of Novistan. Each day, you will be given a set of stories inspired by real-world issues, and you get to decide which ones to run, which to bury, and how to twist each story to conform to your political agenda. Your choices will gradually shape the world around you, altering public opinion and potentially helping the government usher in Orwell’s dystopian nightmare. You can check out a trailer above. The game recently received a major content update, which you can read about here. Headliner: NoviNews is available on Windows PC and Mac via Steam for $13.99. The developers are also working on a Linux port, and potentially a mobile version. A stack of news article sits on your desk, two stampers on each side – green to approve, red to reject. Your reporting team is hacking away in the background as corporate music plays through the loudspeaker. It’s time to make decisions. Will you endorse nationalized healthcare, even though your love interest is worried about increased wait times? Will you demonize the new synthetic alcoholic drink, even though your boss stressed they are an important investor? Will you support current government, as tensions grow between the neighboring country? After work, you emerge on the streets of Novistan, shaped by the very news you publish. Perhaps you will see more graffiti, angry bums or even a riot? Or perhaps you will turn the nation into peaceful utopia, filled with cameras and drones watching your every step? How will your channel address tragic events about to happen? Will you agree to meet the clandestine group of truthtellers, or stop to watch the Prime Minister’s speech? On the way home you meet with three main characters: Evie, your co-worker and immigrant, worried about her health and growing xenophobic sentiment; your brother Justin, an aspiring comedian struggling with impostor syndrome and social anxiety; finally Rudy, a single father trying to provide for her little girl and keep his store afloat, while a mega-mart opens up next door. Each day provides a glimpse into their life and how the media shapes their beliefs. But every Headliner deserves to relax at home from the stress of the job. Listen to the radio and unwind on the comfy couch bought with hard-earned cash, as you watch the city burn outside the window. Perhaps splurge on treats to feed your doggo? Adopt a drone? Have your brother over for dinner? Or maybe keep your doors locked, hoarding every penny, as your apartment slowly fills with piles of cash? After good night’s sleep, it’s time to once again face to boss, new articles, a growing sense of responsibility, and…. power.